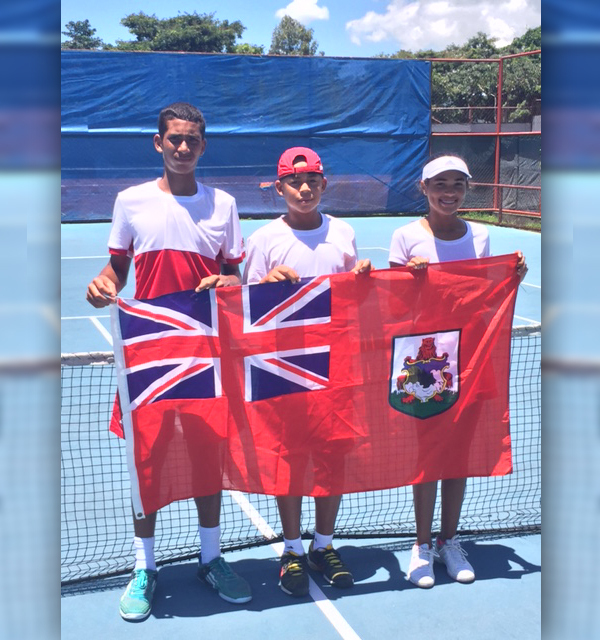 The 14 & Under Jitic Tournament got underway in El Salvador, with Bermuda’s Ricky [Trey] Mallory qualifying for the main draw with victories over Juan Arguelles of Honduras 6-0, 6-0 and John Chin of Jamaica 6-2, 6-3. Mallory was forced to take an injury time due to a tendon strain in his right arm and will receive physiotherapy from former Olympic doctor Jose H. Guerrero who has worked on many tennis players including Nadal and Federer. Ben Jones and Shelby Madeiros did not qualify for the main draw and will now play in the consolation draw. Ben Jones went down to Aiden Carten of Trinidad 6-0, 6-1 in his first match but played a lot smarter and with more intensity in his second match losing to Kofi Bowe of Bahamas 6-2, 2-6, 10-4. Shelby Madeiros — playing in her first international event — went down 6-3, 6-0 to Michaela Stephens of Jamaica. In her second match Shelby went down 7-6, 6-3 to Alesha Alleyne of Barbados. Coach Mallory said, “I was really impressed with Shelby’s matches. She was a bit nervous at first which is to be expected as this was her debut representing Bermuda. “In her second match you could see that her nerves at subsided and she settled into her match playing some excellent tennis. The one thing I appreciate about Shelby is that she never gives up and fights for every point.